Last fall I was invited to a screening of this film for media only. I was excited as this was the first ever media screening that I had ever been invited to, it was an honor to be asked. I arrived at the theater and was surprised that the young women outside and the people at the front desk had not known prior to this that the film was showing. This really was/is top secret stuff. I approached the table I was told to ask at, in the list of possible hundreds of people was my name and I was told I could enter the theater. This movie based on the book of the same name written by Richard Wagamese. 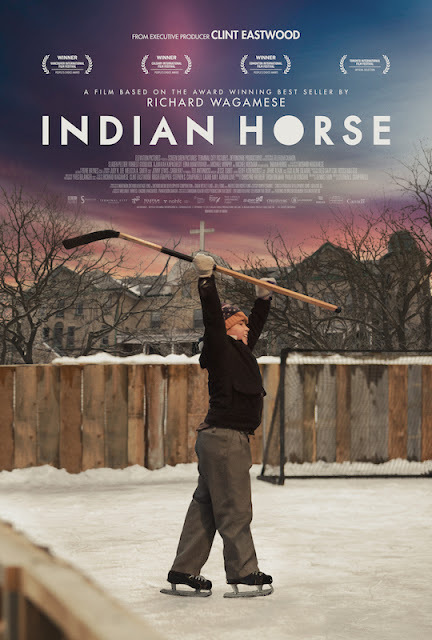 It tells the story of Saul Indian Horse in three different stages of his life and what the affects of residential school not only does to him but the other children that are there. The woman at the center of the picture(above) --Edna Manitowabi is herself a survivor of the residential school system. The film starts out with Saul as an adult in a counseling session and takes us back to the start of his memory of running away from the white men that were taking the children from their families. His parents, grandmother and sick brother to Saul all head away far from the area that such things are happening. As Saul and his family make their own path of survival on their own, his brother becomes increasingly sick. He succumbs to his sickness and his parents want to take him to the city and have him buried by the priests, much to the disagreement of Saul's grandmother. A few months pass and he and his grandmother are forced to move on as winter is fast approaching and she wants them to go the village she is from. They plan to stay there for the winter. 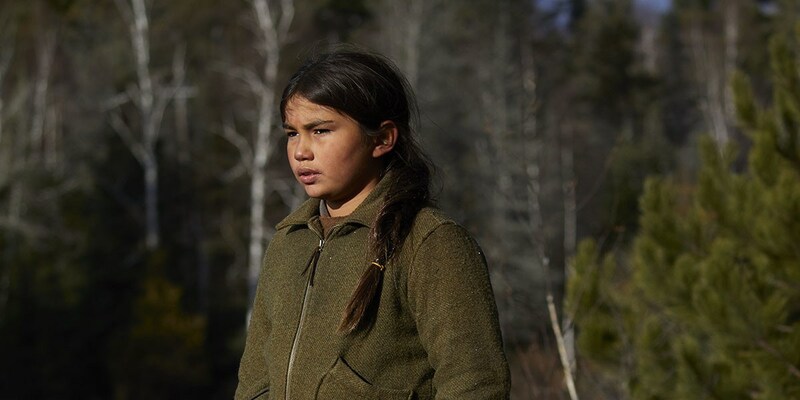 She passes and Saul is dramatically taken away to the residential school , where he is stripped of his clothes, thrown into a bath scrubbed down with white powder. With the last being the cruelest of it all, cutting his ponytail off taking away more of who he is. The school is played as a typical residential school, however one of the priests are more understanding and compassionate to what the children are facing and have quite a number of conversations with the others in the faculty of the school. 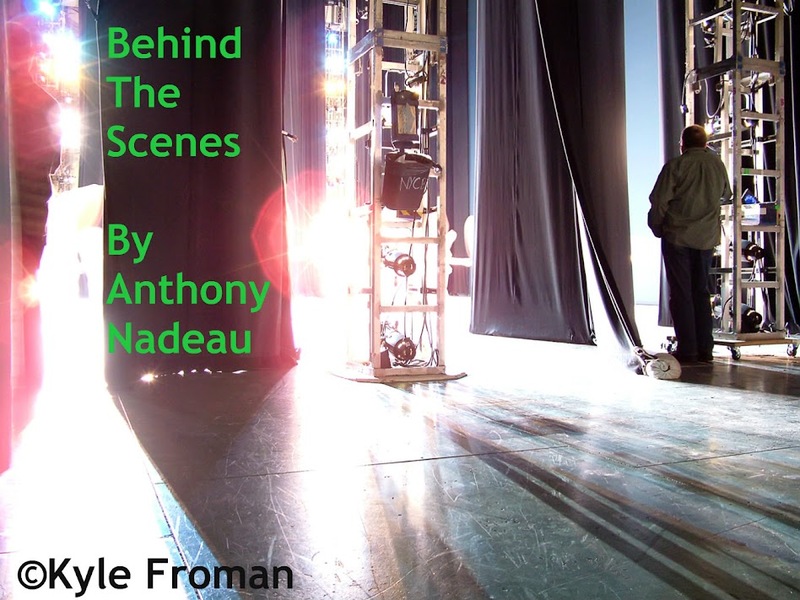 Here is one of the scenes that introduces two of the children-Saul & Lonnie to the ways of the school. In the mix of this story does come some moments of Saul with some of the other children engaging in conversation , or simply having a snowball fight. These little things ad to the depth of the characters and our care for those individuals. There are two young girls Rebecca and Catherine, she feels that Rebecca is like a big sister and they keep getting caught together being friendly like Rebecca holding her up to let her see the hockey rink they are putting together. 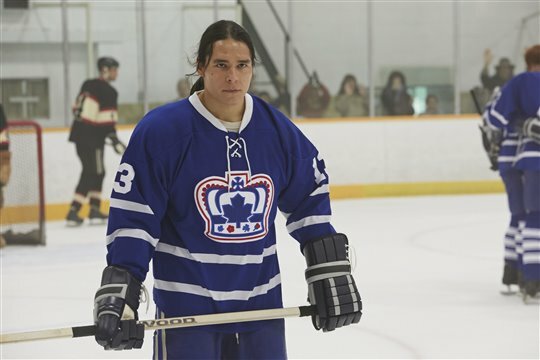 As the film goes on we see Saul at different stages of his life and his love of hockey keeps growing. So much as we follow him into his next stage of life he is taken on by a man that manages The Moose, an all native team. He and his wife even become his guardians. Again as we join him in another stage of his life , he is being recruited by a man that is a scout for a feeder team for the Toronto Maple Leafs. Saul doesn't understand why the man wants to talk to him. The story continues and we follow him through this stage and then one day before a game the father of the school that allowed him to play hockey makes a surprise visit. In a few short days & games Saul's attitude changes and he is more aggressive in his playing, starting to get into fights and getting many penalties as well. Something changed him with that visit, we are not sure what it is. There are some really strong moments in the film that I do not feel would do them justice here in words , but for you the reader to go out and see this film. I have enjoyed watching this a second time around and I would like to thank Carrie Wolfe for allowing me to attend the media screening last fall and again allowing me to see it again as a refresher for this review.